Choose AutoPay and never worry about missing a payment. Once set up, we will automatically debit your bank account, VISA®, MasterCard®, Discover®, or American Express® when your bill is due each month. Visit our mobile site and you'll have the ability to pay your bill 24/7 with just a few clicks. Easy! Simply use your Public Storage online account and click on the Payments link. Your rent is due on the 1st of each month, unless otherwise noted in Your Account. It's best to pay your rent on time and in-full each month to avoid being charged a late fee. 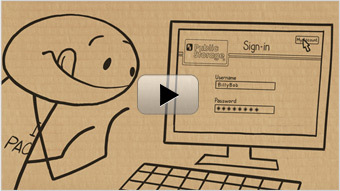 Send payment directly to your Public Storage facility (to find the address, login to Your Account). Please be sure to include your unit number on your check or money order. Pay in person at your Public Storage facility, or at any Public Storage nationwide—just provide your account number and location where you store. Call 1-866-444-4747 and, when prompted, enter the home phone number we have on file for your account. During the call, you will be notified of a transaction fee for this process, if any. Once you've settled into your new unit, we make managing your rental simple with 24/7 online access to Your Account. Please be sure to watch our video, "Managing Your Rental Online," for a quick overview. And soon you'll have even more reasons to love the Internet. Be sure to keep your contact information current — your home address, phone number and email address. That way, we can always pass along any current news and goings-on at Public Storage, or in case of any emergency. Set up and begin using our free AutoPay service or choose to turn it off. You can also change the bank account or credit card used to pay your bill. Should you ever forget your username and/or password, you can request a reminder from the login page and this information will be sent to your contact email address. Pay your monthly bill using the Payments link within your online account. Select options for email notifications that can remind you of things like when your rent is due and when it was received. Purchase insurance or change your policy coverage. Should you require more space, you can always reserve additional units. Public Storage facilities provide convenient access to your stored items. Here are just a few important things to know before visiting your unit. Units are accessible any time during Gate Hours. Daily, 6 a.m. to 10 p.m.
Who Can Use My Unit? Up to four other people are allowed to use your unit. To ensure their unrestricted use of our property, please add the names of those with authorized access in Your Account settings. You may also want to provide them with their own key, as we do not keep a copy. Units are secured with your own lock, and we do not keep a copy of the key. However, if your key is lost, please see your property manager for assistance with restoring access. When the time comes to move out or even change unit sizes, please review the information below to make your transition a simple one. If at any time you decide that a smaller or larger unit better suits your needs, please contact your property manager. They are experts at helping find the perfect storage solution for your situation and can assist with this transition. You can give notice of your intention to move out up to 60 days in advance. We recommend starting this process online, which will notify your manager of your desired move-out date. If you later decide you need more time, you can always change the move-out date or even cancel the notice and continue storing with us. On your scheduled move-out day, simply remove your lock and make sure the unit is emptied of all contents. Finally, please let your property manager know when this is completed for their quick inspection and records.